It was way back in the middle of January that the lock on the junction of Gloucester & Sharpness Canal with the Severn was closed, with boaters unable to pass through, its cause it is understood, is a leaking cill, Alan Tilbury reports. Though boaters asked it could be temporary filled to allow passage, this was refused, but even now it is not known when the work will be completed, only that Canal & River Trust tell that the work is complicated and that there is a great deal of silt to be removed. Why it has not been removed in the past three months is not told. 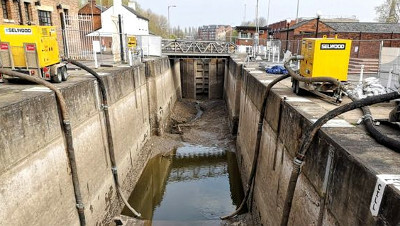 The lock was drained in January in preparation for a new cill, but nothing has been done, with reports that there are no workers on site and no sense of urgency. Boaters cannot understand why a crane has not been brought in to lift the boats over the lock, especially as a number of traders are being prevented from getting to Birmingham for an event. It was told that the work would be completed by Easter, but as seems to be only too common these days, the opening has been delayed.